The Orion Nebula is probably at least 200 light-years closer to Earth than currently thought, says an astronomer in England. The new distance boosts the estimated age of the nebula's many stars by 70 percent. Appearing as a fuzzy object in Orion's sword, the Orion Nebula is the most famous stellar nursery in the Galaxy. It is a cloud of gas and dust that has spawned a cluster containing more than 3,000 stars, the hottest of which make the nebula glow. Consequently, the Orion Nebula is visible to the unaided eye--despite a distance from Earth that most authorities put at 1,500 or 1,600 light-years. But the true distance is much less than this, according to new work by Rob Jeffries at Keele University in England. He exploited the rotation of G (yellow), K (orange), and M (red) stars in the Orion Nebula cluster to deduce that they are only about 1,300 light-years distant. "I think this is a fantastic piece of work," says Lynne Hillenbrand at the California Institute of Technology. She has studied the Orion Nebula for more than a decade but was not affiliated with the new work. "It's a very interesting technique," she says, "and I think it is valid." To derive the Orion Nebula's distance, Jeffries examined the luminosities of thirty-four G, K, and M stars. Luminosity refers to how much light a star radiates into space. It depends on just two things: a star's temperature and its diameter. The hotter the star, the more light it emits; also, the bigger the star, the more light it emits, because the star has a greater area from which to radiate its light. Other astronomers have measured spectral types for the stars and thereby deduced stellar temperatures. Since a star's luminosity depends on the fourth power of its temperature, a doubling of temperature corresponds to a sixteen-fold increase in luminosity. Thus, an accurate temperature is crucial. Deriving the second stellar parameter--diameter--is trickier. To do so, Jeffries compared two different measures of the stars' rotation. First, other astronomers have been able to determine how long the stars take to spin. That's because starspots make the stars brighten and fade as they rotate. Monitoring the star's brightness therefore reveals the rotation period. Second, still other astronomers have measured how fast the stars spin. This is possible because one limb of a rotating star moves toward us, blueshifting that limb's light, while the other limb moves away from us, redshifting its light. As a result, rotation smears out all of the star's spectral lines. Measuring the breadth of the spectral lines thus reveals the star's rotation velocity. By comparing the rotation period with the rotation velocity, Jeffries can deduce the star's diameter. For example, if a star rotates once a day, and if its rotation velocity is 3.14 million miles per day, then its circumference must be 3.14 million miles and its diameter must be 1 million miles. In this way, Jeffries derived the diameters of the thirty-four stars. These, plus the temperatures, yielded the stars' luminosities. Comparing the luminosities with the stars' apparent brightnesses then unveiled the distance to the Orion Nebula: 1,279 ± 104 light-years. One complication exists. When astronomers measure a star's rotation velocity, they do not know the orientation of its rotation axis. If the rotation axis points right at Earth, so that astronomers view the star pole-on, then no part of the star moves toward or away from observers, even though the star may be spinning fast. On the other hand, if the rotation axis is perpendicular to our line of sight, then astronomers see the full effect of the star's rotation. To circumvent this problem, Jeffries assumed the stars' rotation axes are randomly distributed. In the 1990s, other astronomers used stellar rotation to measure distances to the Pleiades star cluster and to the Taurus molecular cloud, which harbors the young star T Tauri. When astronomers later measured parallaxes for stars in these objects, they agreed well with the derived distances. Thus, says Jeffries, the same method should yield an accurate distance to the Orion Nebula. The change in estimated distance has a big effect on the estimated age of the Orion Nebula cluster. All the stars Jeffries studied are pre-main-sequence stars--they do not yet fuse hydrogen-1 into helium, the way the Sun does. Instead, they shine because gravity is squeezing them, making them get smaller and thereby generate heat and light. In a similar way, gravity causes water to fall over a hydroelectric dam and produce electricity. As pre-main-sequence stars age, they get smaller and thus emit less light. 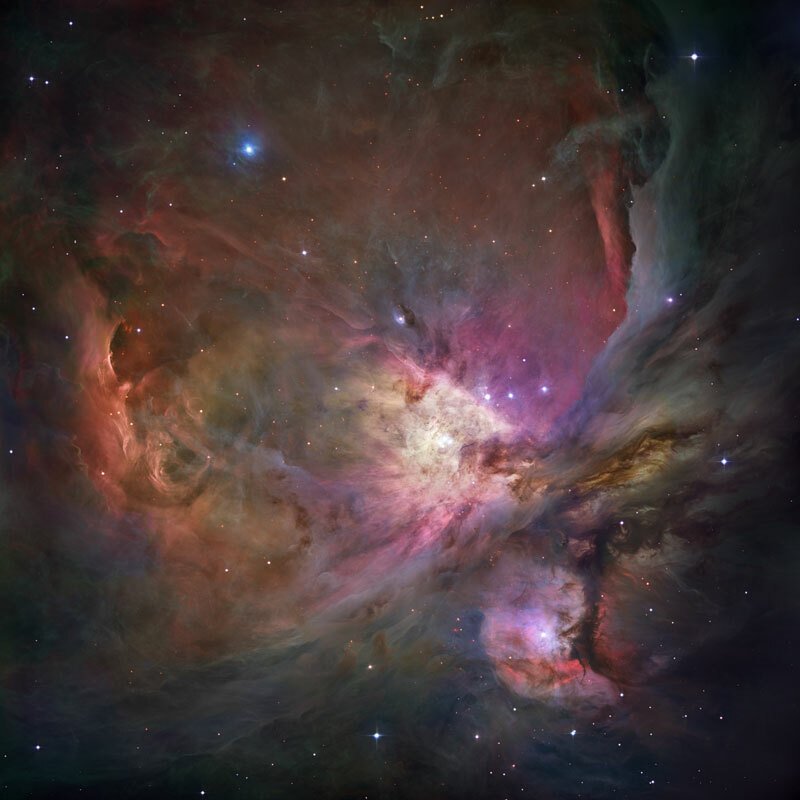 The new distance to the Orion Nebula means the stars emit less light into space than had been thought--so they are smaller and therefore older than had been thought. According to Hillenbrand, the old distance to the Orion Nebula gave an age for its stars of slightly under 1 million years. The new distance, says Jeffries, raises the age by 70 percent, which means the Orion Nebula cluster is about 1.5 million years old. Jeffries will publish his work in a future issue of Monthly Notices of the Royal Astronomical Society. Update (June 19, 2007): The parallax of a star in the Orion Nebula confirms the new distance.